Quentin Beck used his knowledge of special effects and illusions to become Mysterio in an attempt to first destroy Spider-Man and later Daredevil. Holy moly, this may be the most expensive Minimate ever made. 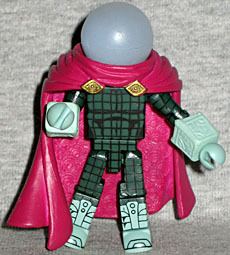 Mysterio has a very distinct look, and this figure goes out of its way to duplicate that. First of all, tampographing details on a figure is expensive - more expensive than molding new parts, sometimes - and Mysterio's tablecoth-patterned costume is detailed the whole way 'round. He's got complicated designs on his boots, and anatomical details on his chest and back. Then, he's got several new molded pieces with no re-use potential: the square cuffs of his gloves, the giant purple cape with eyes on the collar and a fully sculpted pattern on the lining, plus that perfectly spherical head. Nobody else is ever going to use any of those things! 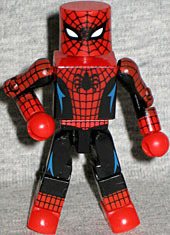 In keeping with the "tampos cost money" theme, Spider-Man is one of the most expensive Minimates Art Asylum makes. Maybe they should cut back on him then, eh? This one is "Amazing Fantasy Spider-Man, and since it doesn't involve MJ and the Black Cat making him a sandwich, we have to assume the Amazing Fantasy refers to the comic where he first appeared. Why not call him "First Appearance Spider-Man?" Because reasons. outsides of his costume are black, rather than blue, and he's got tiny eyes. Like Series 18's Battle Damage Spider-Man, the reds don't match between the arms, chest and extremities. To really be accurate the spider on his back should be light blue, not red, but who's going to know that? In any case, he certainly doesn't look like a modern Spidey. Amazing Fantasty Spider-Man isn't very thrilling, but Mysterio is truly impressive. Good enough, in fact, to make it worth buying this set just for him. Just found this Mysterio at a toy store alone for $3. he's one of my new favorite minimates, and that says a lot.